Our football memories might just save football from itself. Or, at the very least, preserve something of its soul and heritage. A goal, an away trip, a European jaunt? Or maybe the footballing memory helps frame a memory about friends or family. Regular readers will know that the Scottish Football Blog is quite the fan of such anecdotal diversions. 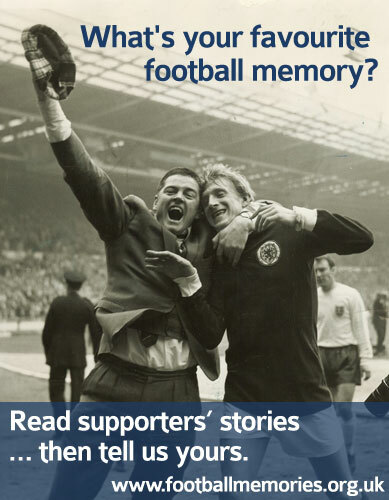 So I'm already fascinated by Football Memories, a new site launched by Alzheimer Scotland where fans - the famous, the not-so-famous and the not-famous-at-all - can share their own football stories. Have a browse, nod in appreciation as someone else's memory brings a favourite memory of your own flooding back and enjoy. While you're there check out the story behind the site and Alzheimer Scotland's wider Football Reminiscence project. The project - which is already producing admirable results - helps people with dementia by using football to stimulate memories. A superb example of football's unique power being used to change lives. > Alzheimer Scotland is one of the charities I'm raising money for with the Scottish Football Blog blogathon on 19 November.